The new handset to challenge HTC? LG's latest flagship phone, the LG G2, is on sale from today in stores nationwide, including Carphone Warehouse, EE, Three and O2. 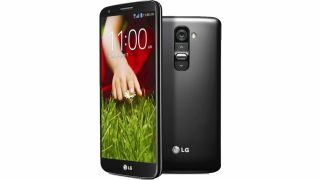 The LG G2 aims for a combination of specs and innovation, with a 2.26 GHz quad-core processor, 2GB of RAM, a dazzling 5.2 inch full HD IPS display and an impressive 13 megapixel camera. It's also rocking a Snapdragon 800 CPU at its heart, so the battery life is pretty darn good - plus it's rocking an insanely low PAYG price. On the innovation side there are features like 'KnockON' which allows you to turn the screen on by tapping it twice and buttons on the back which supposedly make it easier to operate one-handed. Speaking of those buttons, we weren't too convinced by the placement and the overall design is also a little bland, but that did little to dampen our enthusiasm for a largely brilliant handset. The LG G2 is listed on Three at a not unreasonable £399.99 for pay as you go or from £29 per month on contract (with £49 upfront), while Carphone Warehouse has it from £32 per month on O2 and from £37 per month on Vodafone with no upfront cost. EE is yet to list its prices. The LG G2 has launched surprisingly close to the iPhone 5S and will have its work cut out for it if it wants to make much of a dent on that phone's sales. With the Nexus 5 likely to be just around the corner too competition is going to be fierce. For more thoughts on the LG G2 check out the TechRadar team's reaction to its unveiling.